Complex poem evoked from a stamp of a complex man. A complex man who promoted simplicity. One of my paranoia is that our population will outgrow our planet’s ability to feed and water us. Is our current battle for attention and power a tell-tail or just normal human nature that repeats throughout history. This poem predicts societal collapse and heeds Thoreau’s environmental advice. Feel free to comment with your transcendentalist wonderings. 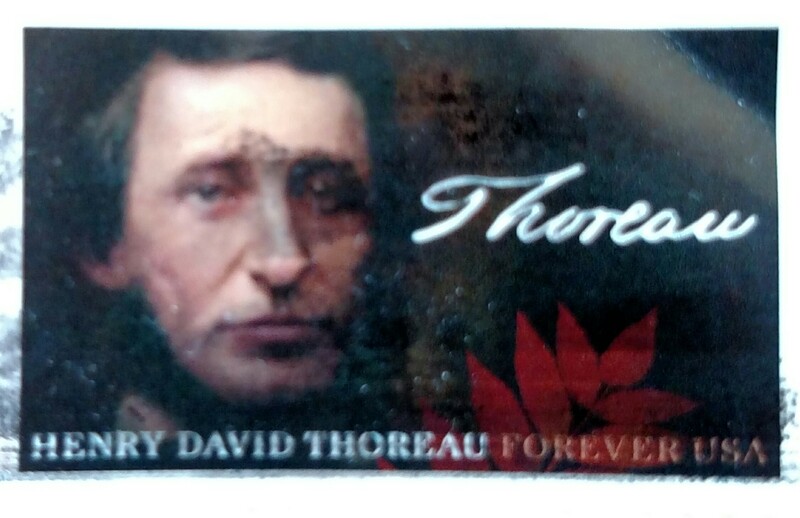 Thoreau a timeless voice of whoa. and promoter of less government, honest government. when resources no longer support swollen populations. the ways of living simply with the land. This entry was posted in NaPoWriMo and tagged boom and bust, collapse, environmentalism, environmentalist, Henry David Thoreau, living off the land, postage stamp, simple living, simplicity, stamp, stamp collection, Throreau, transcendentalism, transcendentalist. Bookmark the permalink. Thanks Mom for the typo catch on “planet.” It is a bit odd but you nailed it with meaning of “whoa,” holding back the horses reins instead of headlong plunging ‘forward’ into disaster. I like the unintended meaning of “woe” too. It is great how a poem really is its own creature rather than completely of the poet’s making.